This product is part of the BioCeuticals Herbal Extracts, a range recommended for practitioners qualified in herbal medicine. The BioCeuticals Herbal Extracts are designed for extemporaneous compounding and dispensing for an individual patient following a consultation. 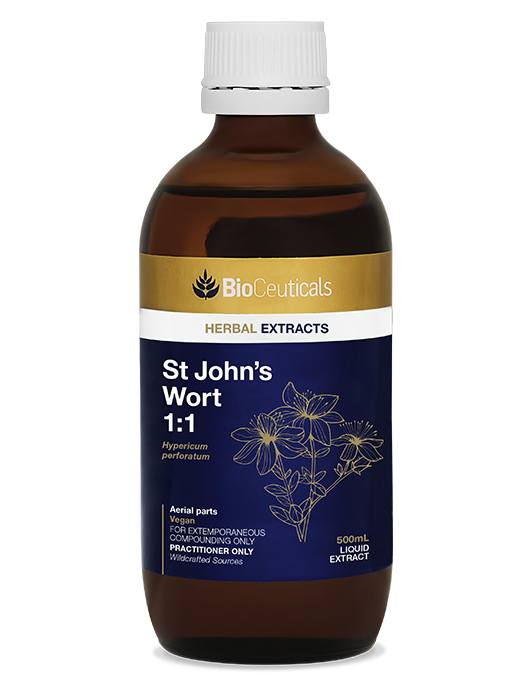 St. John’s wort (SJW) is a herbaceous, flowering perennial that can grow up to one metre in height. It grows abundantly in uncultivated ground; woods, meadows and roadsides, throughout many areas of the world. It possesses pale, glabrous leaves that are dotted with distinctively transparent oil glands and its flowers are a bright, characteristic yellow. Solvents: 60% organic cane ethanol, 40% mountain spring water. Recommended dose: 20-40mL per week. For practitioner compounding and dispensing only. Do not use if seal on cap is broken. 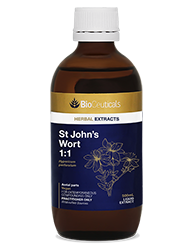 For further education and research, refer to the BioCeuticals St John's Wort Monograph.